The results of the Paris Book festival are in! 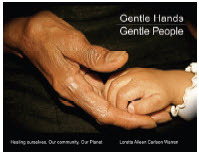 Gentle Hands, Gentle People by CIPA Member and author, Loretta A. C. Warren was the winner in the Spiritual division. There will be a reception in San Francisco on May 19 at the Sir Francis Drake to recognize all the winners. Loretta and her partner, Dr. Aida Sahud, will be attending. A luncheon for all the winners is planned for June in Paris.